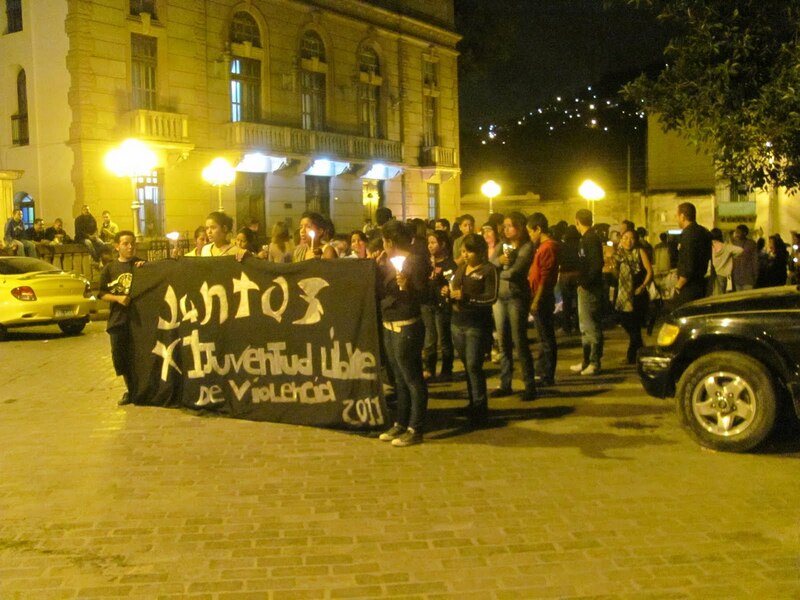 At the end of this post is an English translation of a press release by the Platform for Action in for Youth Rights in Honduras (Plataforma de Acción en Pro de los Derechos Juveniles de Honduras) released yesterday, October 15, 2010. This coalition of youth groups marched silently from the National Theatre to Central Park in Tegucigalpa, where they held a vigil to remember and demand action with respect to the alarming rate of violence against young people in Honduras, especially in the wake of the coup d'état last year and under subsequent political regimes. There were at least a couple of hundred young people there, from middle school to high-school aged. 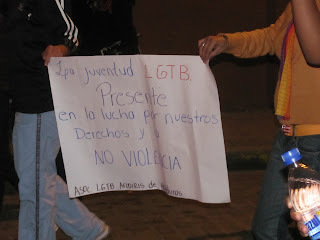 Some were bussed in from the Amareteca Valley and other colonias outside the city centre, others came on their own, and there was representation various schools and communities, including significant presence from LGBTI youth groups, who have suffered particularly in the increased rates of violence since the coup. There were a handful of adult support-people present, some from youth-focused organizations and others who were family members, but most walked to the side or behind the group, accompanying the young people in their vigil. Some young street performers on stilts and performing fire tricks helped lead the vigil quietly towards the park. Banners read "Together for a Youth free from violence in 2011," "No more deaths in impunity," "Those who don't punish the evil deeds are the same ones who order them," "No More Violence," and "LGBT Youth: Present in the struggle for our rights and non-violence." There was no media present, though organizers stated had called major papers and stations. The FNRP radio program on Radio Globo from 8-9 PM announced the event while it was still in progress, commending the youth and reading a part of their media release. October 15, 2010, Tegucigalpa, M.D.C. 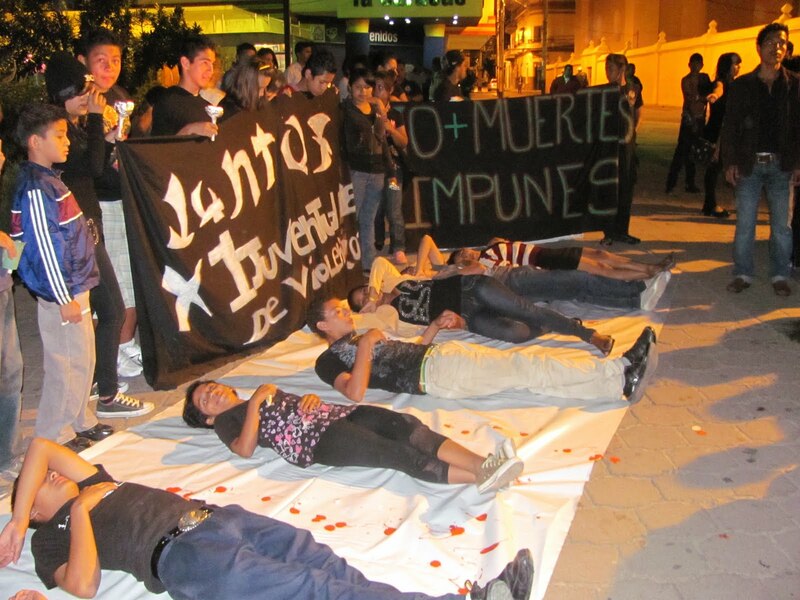 The Platform for Action for Youth Rights in Honduras is a space for youth participation with clear ideological principles; among them the struggle for youth rights in Honduras. On this occasion of International Youth Day it is clear to us that this day, beyond a celebration, is an opportunity to denounce and declare ourselves against the constant human rights violations that young people are subject to. For these reasons, today, Friday October the 15th, 2010, we are carrying out an activity called TOGETHER FOR A YOUTH FREE FROM VIOLENCE IN 2011. We denounce the constant human rights violations that we are subject to daily as youth and we are making an urgent call to the appropriate authorities that they take action and stop being passive, because as long as they stand with their arms crossed our youth are being further victimized by the system. We demand explanations for all extra-judicial murders and declare ourselves against the sensationalist media of our country that every day displays the deaths of young people as deaths within a violent population, leaving the impression that youth are the most violent people in our country. We strongly condemn student repression, which many of our colleagues from different schools across the country have been the victims of ,just for exercising their right to free association and public protest; a right which is ratified by the constitution of our republic. We demand that the government respect the lives of young people or we will doubt the possibilities for justice as well as the interest of our government in the serious issues facing youth people and proceed to appeal to international levels of jurisdiction. We call upon all Honduran youth to refound our beloved Honduras and not to forget that the direction of this country is in our hands, but we must also continue firmly in the struggle and not give in, and make it clear that YOUTH are not the problem; we are the SOLUTION.